There are numerous tried and tested recipes for birthday cakes that have become classics. It is always possible to adapt these to suit your own occasion and taste though! 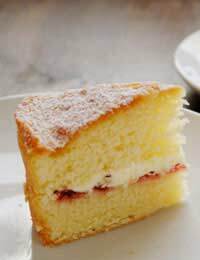 Madeira sponge and Victoria sandwich are among the classics; see ‘Birthday Cakes for a First Birthday’ article for both of these recipes. Prepare your 20.3cm cake tin by greasing and lining it-the paper should be about 1.2cm above the rim of the tin-then grease the paper lining too.In a large mixing bowl, use a wooden spoon to cream together the butter and sugar until it is light and fluffy in texture. In a separate bowl, beat the eggs together, then, slowly add them to the large mixing bowl.Make a paste (in a cup is easiest) with the cocoa powder and a little cold water. Beat some of this paste into the creamed mixture, then, some of the flour, then more of the paste, followed by flour and so on, until you have used it all. Transfer the mixture to your prepared cake tin and smooth the top surface with a palette knife.Pop the cake tin into the centre of a preheated oven and bake for approximately 30 minutes. Prepare the filling while the cake mixture is baking. As with the cake mixture, beat the butter and sugar together, then add sifted icing sugar. Blend the ingredients together and then add the coffee essence and milk. When the cake is well risen and feels ‘springy’ it can be turned out onto a wire rack to cool.Once it is cold, slice it in half horizontally and spread the filling evenly over the bottom half. Gently press the top half onto the filling-covered base and dust with icing sugar.Decorate as you wish for the finishing touches. Cream the butter and sugar together in a large mixing bowl until light and fluffy. Add the vanilla essence. Beat the eggs separately, then, slowly add them to the mixing bowl. Add the rum.Next, add the flour, a little at a time and stir well.Finally, add the mixed fruit and syrup. Transfer the mixture to your prepared 21cm tin, level the top. To get rid of any air bubbles, pick up the tin and drop it (gently! )on the worktop. This also helps to level the mixture before baking.Place just below the centre of the oven and bake for about 2-and-a-half hours. When the cake is cooked, wrap it in a clean tea towel and leave it-still in the tin-to cool for about 12 hours.Almond paste makes a good covering for this cake, which can then be decorated as you wish. Grease two 17.5cm sandwich tins.Separate the eggs and beat the whites until they begin to stiffen into peaks, then, slowly add the sugar and combine well. Next, add the beaten egg yolks and stir well. Now sift the flour into the mixture, stirring constantly.Add the melted butter and hot water together and stir in quickly.Divide the mixture between the two tins and bake for about 20 minutes. Turn the cake halves onto a wire rack to cool. Spread your chosen filling over the bottom cake and press the two halves together, then, cover and decorate as desired.